On Friday, January 25 the Prayer service for the unity of all Christians was held in the Catholic Church of St. Mary of Lourdes in St. Petersburg. 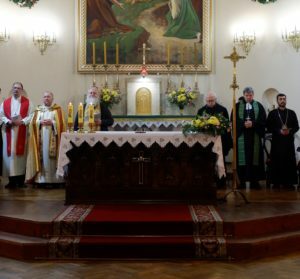 Ministers and parishioners from the Orthodox, Catholic, two Lutheran and Armenian Churches participated in the Prayer service. The Evangelical Lutheran Church of Ingria was represented by the senior pastor of St. Mary’s Cathedral Rev. Mikhail Ivanov.